Robert Ramsay Cellars wines in a casual, relaxed atmosphere is what's coming soon for the upper Queen Anne neighborhood. The winery, started in 2005, has a tasting room in Woodinville; this is their next step in spreading the word about their wines. Robert Ramsay Harris ("Bob" to most) and wife Lauren Vogt are happy to be bringing something new to the neighborhood they live in. Lauren, who began running the business two years ago, is masterminding the project: having a new bar built in the space, choosing paint colors, deciding on food to go with the wine, and finalizing the concept. "We don't want it to be a tasting room; we have that in Woodinville. We want it to be a place where neighbors come to relax and hang out several times a week. We'll offer flights (three wines for $10 and five for $15), glass pours, and bottles. Or someone can stop by and pick up a bottle to take home. We'll have a little food, pre-made items like crackers, cheese, olives, meats." Pendant lights will hang above the bar, barrel-slat shelves will be on the wall behind the bar along with a chalkboard, and barrel tables will be scattered around the room. They'll be open Wednesday through Sunday; hours are still being finalized. Lauren's shooting for a late March/early April opening and has already hired someone to run the room. 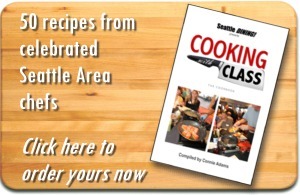 "We'll be promoting the wine club more in Queen Anne than in Woodinville. The club is the best way for us to sell our wine and it gives our members discounts." 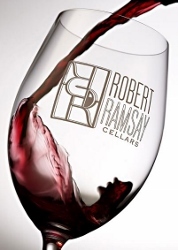 Robert Ramsay Cellars' name is a combination of Bob's first name and his great uncle's last name. "Bob fell in love at 19 with a Côte Rôtie. It's a joy for him to make something that people like," says Lauren. "He's had his fruit sources for a long time, and has his oak program dialed in. 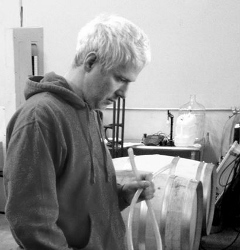 He's the owner/executive wine maker and Kristin Scheelar is our winemaker." They started with one Syrah, making 125 cases. They now make 11 wines (four available to club members only) and 3000 cases a year. Their wines express fruit, minerality, and earthiness, made from grapes from Horse Heaven Hills, Snipes Mountain, Red Mountain, and Yakima Valley. The Woodinville tasting room opened in 2009. Cabernet Sauvignon was their second wine, and they acquired Mourvedre to blend into their Syrah. They decided it was so good, they would make it as a single varietal. It has since become their flagship wine. 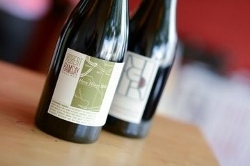 Rhône blends and varietals followed, all made from Washington state grapes. In addition to their reds, they make a Columbia Valley Rose and this is their second year for a Grenache Blanc de Noir from the Grenache Noir grape. Robert Ramsay Cellars is still new enough that Bob continues to work his day job in software. Lauren is also from the tech industry where she was a consultant for online branding and social media. "I may want to try something different in the future, but right now, running our business and raising our daughter Mary Mason is what I'm focused on. Bob is the big picture person and I'm the detailed one. It's been very fun to grow and brand this business. There are a lot of good wines in Washington, but we're a little different, being one of the fewer wineries focusing on Rhône varietals, which are emerging in Washington state." Opening the wine room on Queen Anne is proving to be another good experience for them. "We feel welcome here and have a community following, since we live three blocks away from our new space." They know Dr. Christine Schaffner who runs the Bella Fiore Med Spa and Klinik in the building and are across the hall from Queen Anne Olive Oil Company. The neighborhood now has the perfect "market" for pleasure and health!